German first aid station in the Vosges. Wounded soldiers who come out of the battle to be taken away by ambulance cars. 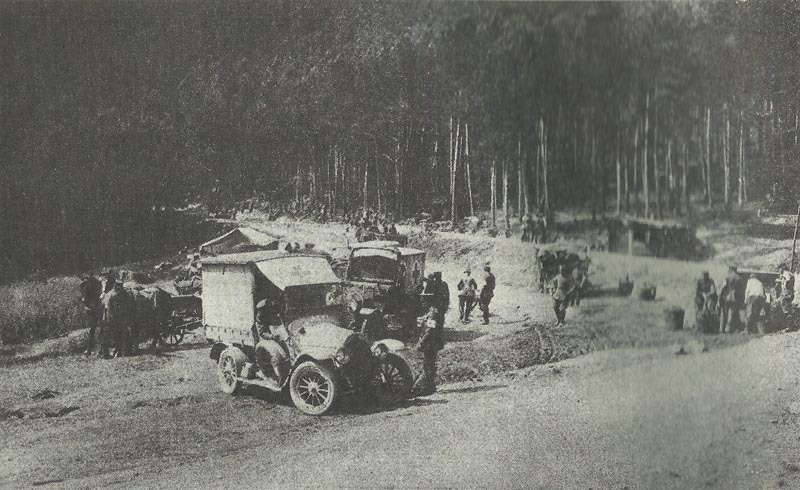 Vosges: French storm trenches on Ablain-Angres road, but Germans retake it next day. French storm trenches on Schratzmännele crest and take the crest on August 22. Isonzo: Italian progress towards Tolmino and in Upper Rienz (Julian Alps); attack on former on August 23. Baltic: 2 German destroyers shell and machine gun and cripple Royal Navy submarine E13 (14 crew killed) which is stranded on Saltholm Island in the Sound (international waters) despite 3 Danish torpedo boats. E8 gets through, meets E9 and Russian destroyer on August 22. Bulgaria: War and Foreign MInisters resigns. Britain: Police raid Labour Leader offices.